Dizi Gui (Standards for Being a Good Student and Child) is an ancient Chinese text for children that teaches moral values and proper etiquette. It was written during the Qing Dynasty during the reign of Emperor Kangxi (1661-1722) by Li Yuxiu. Beneath the conservative, “old-school” verbose of this ancient classic, one can still find gems of wisdom that remain surprisingly relevant to our modern society. A new lesson is covered in each issue. We’ve reached the last chapter of Dizi Gui, “Devote any Remaining Energy to Acquiring Knowledge”. Since ancient times, actively pursuing knowledge and education has been considered a commendable quality—it reflects the person’s awareness of his limitations and his thirst for improvement. There is a well-known Chinese idiom, “discussing military tactics on paper”. It is used to describe a person who only knows how to engage in theoretical discussion, but is useless at putting his talk to real application. This idiom stems from China’s Warring States Period, when the State of Qin was at war with the State of Zhao. The Qin army, led by General Wang He, had taken one of Zhao’s prefectures, Shangdang, and planned to invade further into Changping. The King of Zhao’s general, Lian Po (廉颇), was defending Changping from the Qin army. Although General Wang repeatedly challenged the Zhao army to open-field battle, the intelligent and experienced Lian Po refused to directly engage the Qin army, choosing to defend Changping behind its walls. Unable to draw out and defeat the Zhao army, the King of Qin devised a plan to get rid of Lian Po. Zhao Kuo was in fact the son of a famous general. Having studied military science since young, he was an eloquent and convincing speaker when it came to military strategies. But Zhao Kuo was also arrogant and thought the world of himself. He even considered himself far superior to his own father, an experienced general. Zhao Kuo ((趙括): The story of Zhao Kup has developed into the Chinese idiom 纸上谈兵 or engaging in “paper warfare”. The Chinese idiom, “discussing military tactics on paper”, describes a person who only knows how to engage in theoretical discussion, but is useless at putting his talk into real application. The King of Zhao called Zhao Kuo to him, and eagerly asked if he could drive the Qin army away. Delightedly, the King of Zhao immediately promoted Zhao Kuo to top general, and sent him to relieve Lian Po. But when the King of Qin heard that Zhao Kuo had replaced Lian Po, he knew his scheme had worked. Shrewdly, he sent General Bai Qi instead of Wang He to meet the Zhao army. Bai Qi laid out the majority of his troops for an ambush, and pretended to lose and flee from the first few battles. When the naive Zhao Kuo urged his Zhao army after the Qin army, they fell into the Qin’s ambush, which split the Zhao army into two groups. Surrounded by the Qin army with only half his men, Zhao Kuo had no choice but to wait for reinforcements. But the Qin army was again one step ahead—they cut off the route for the Zhao army’s reinforcements and supplies. For forty days, the Zhao army suffered, until Zhao Kuo decided to charge through the Qin’s blockade. He was then shot to death by the Qin troops. As their general fell, the Zhao army threw down their weapons and immediately surrendered. As Anton Chekov once said, “Knowledge is of no value unless you put it into practice.” Having only studied theories from his father’s books, Zhao Kuo was the quintessential “armchair strategist” with zero practical experience in open warfare. The 400,000-strong Zhao army was thus effortlessly wiped out in the hands of their incompetent general. 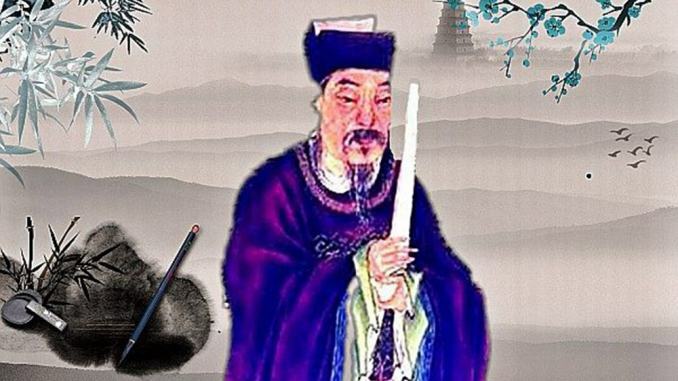 By constantly expanding his knowledge, the Chinese general Lü Meng (呂蒙) transformed from a “mindless warrior” into one of China’s most successful generals. There was a military general Lü Meng (呂蒙) who served under the warlord Sun Quan during the Three Kingdoms Period. Early in his career, although noted for his bravery and fighting skills, Lü was often looked down upon as a “mindless warrior” due to his lack of literacy skills. In fact, Sun Quan’s general Lu Su thought so little of Lü that he refused to speak to him, deeming it a waste of his time. 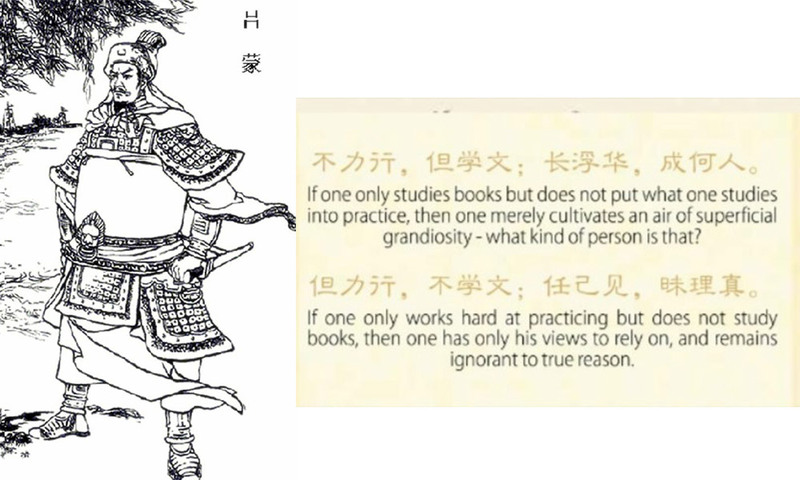 Lü initially made excuses that he was “too busy” to spend time studying books, preferring to practice his fighting skills. 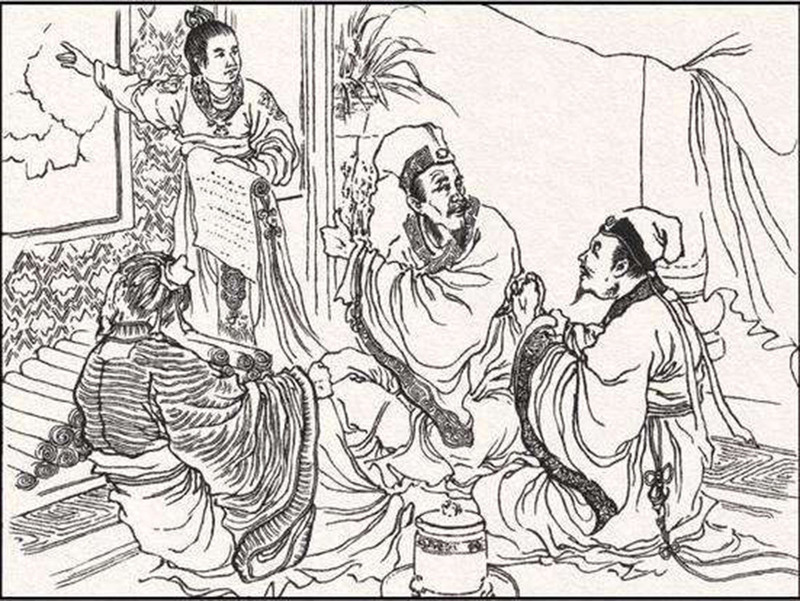 But with Sun Quan’s encouragement, Lü eventually started using any remaining time and energy he had to study military texts. Gradually, Lü became a learned and competent leader, eventually succeeding Lu Su to become frontline commander of Sun Quan’s forces. In the final moments of his successful career, he led a carefully executed invasion of Liu Bei’s territories in Jing Province, defeating and seizing all of the lands from Liu Bei’s general Guan Yu. In order to improve, we need to achieve the optimum balance of both knowledge and practice—consistently. Lü continued with his scholarly pursuits even in his later years, and he encapsulates a person who devoted equal effort to theory and practice. This defining quality proved to be the key to his great achievements. The same principle applies throughout history-—American president Abraham Lincoln, who had only one year of formal education, credits his success to a voracious appetite for reading. And in our present day, CEOs of Fortune 500 companies read an average of four to five books a month. Furthering oneself is not just about practice, but about consistently acquiring the knowledge as well.